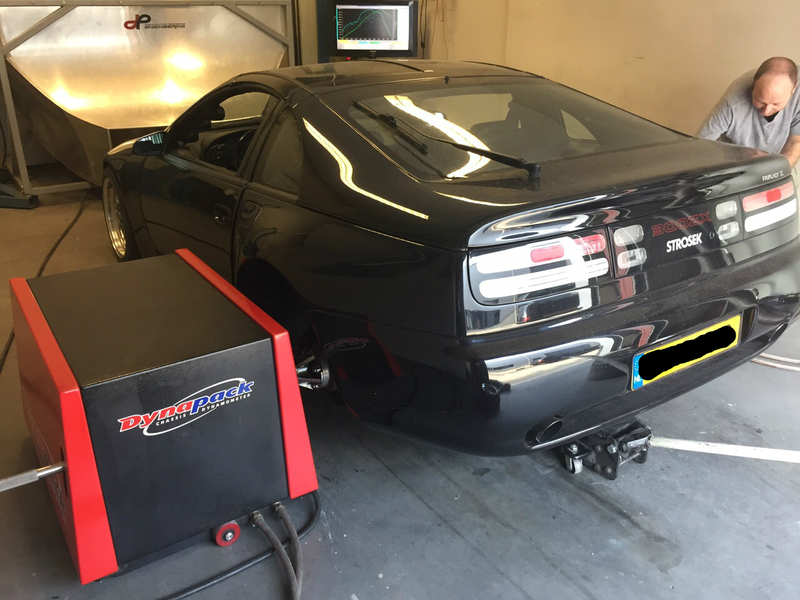 A heavily tuned VG30DETT that I built for a customer, and installed in his 300zx Twinturbo over 2014 and 2015. 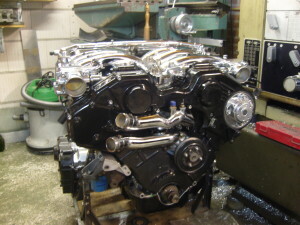 The VG30DETT on this page is an engine I built in 2012. 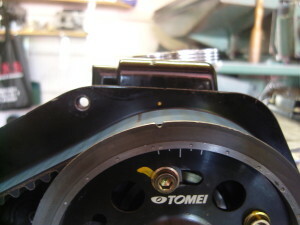 Bored 2.5mm oversize (with a deck plate) for forged Tomei pistons, forged Eagle rods, a good factory crank and all new Nissan bearings. 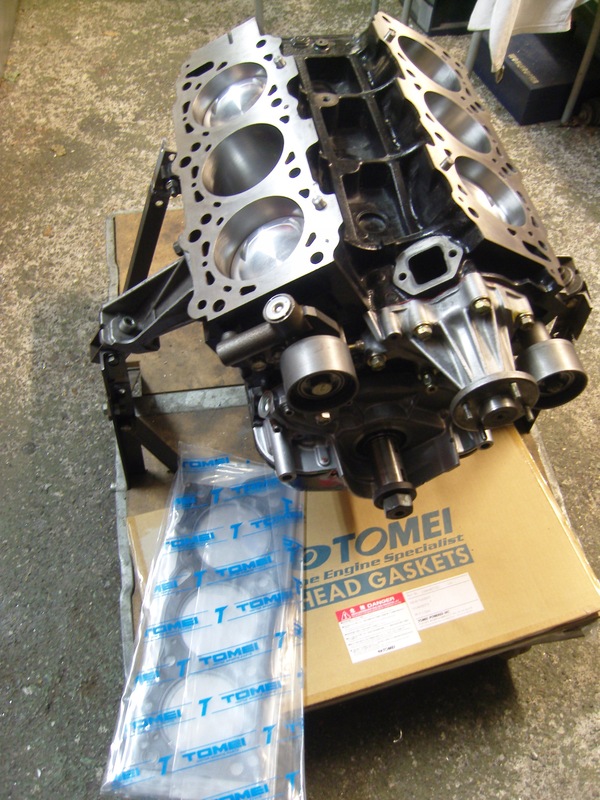 The steel head gaskets are made by Tomei held down with ARP head studs, and the cylinder heads had been neatly ported by JUN racing Japan. 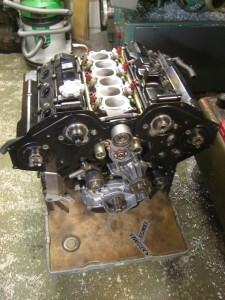 The heads received new 0,5mm oversized valves with bronze guides, and a 3 angle valve seat cut. New guides were not required, but the bronze guides do improve the heat transfer from the valves to the heads. I widened the combustion chambers along the valves for additional airflow since the larger cylinder bore allowed this. Compression was slightly increased from 1:8,5 to 1:8,7. The oversize cylinder bore increased the capacity from 2960cc to 3133cc, around 6% extra. Combined all these factors alone would result in about 10% power increase over a factory engine. 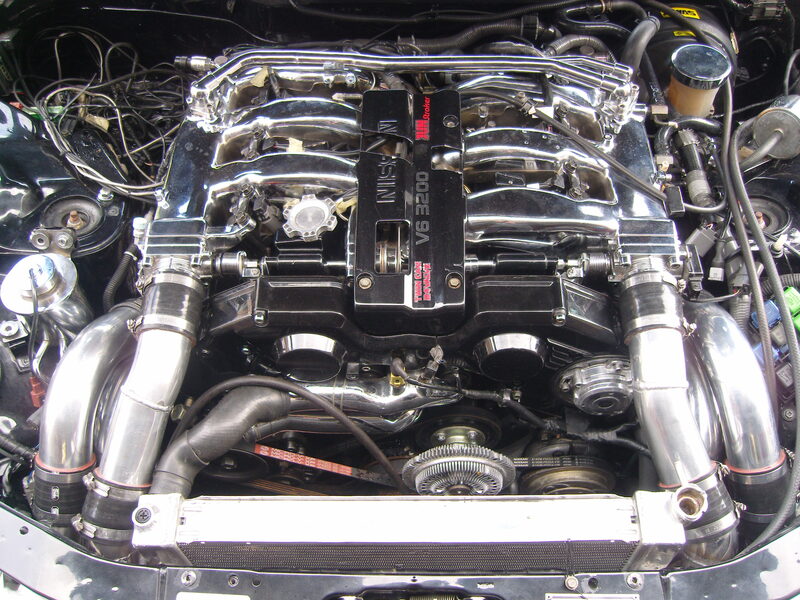 The 300zx had been fitted in 2013 with a JUN racing engine, of which I even helped to setup the heads. 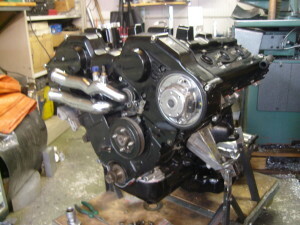 The engine before that one had died from oil starvation, blamed on a faulty oil cooler circuit and/or a bad oil pump. 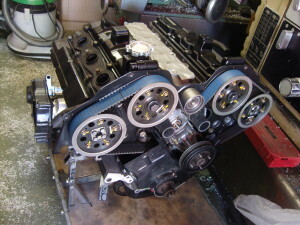 But as the tuner was tuning the engine management for the brand new JUN engine, that engine ran dry from oil starvation as well. It turned out that the torque converter from the aftermarket automatic transmission applied so much pressure on the crank it ruined the axial bearing, and in doing so also the oil pump. The customer was so disappointed it took him a year to find the courage to start over again. 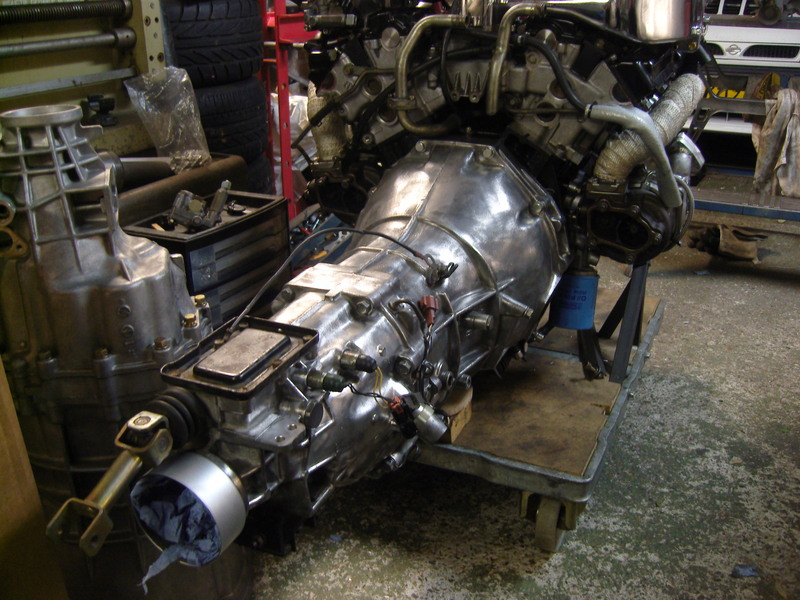 This time, with a manual transmission to rule out any issues with the automatic transmission. The damaged JUN engine was additionally equipped with JUN racing camshafts with a ‘solid lifter’ conversion from Tomei. 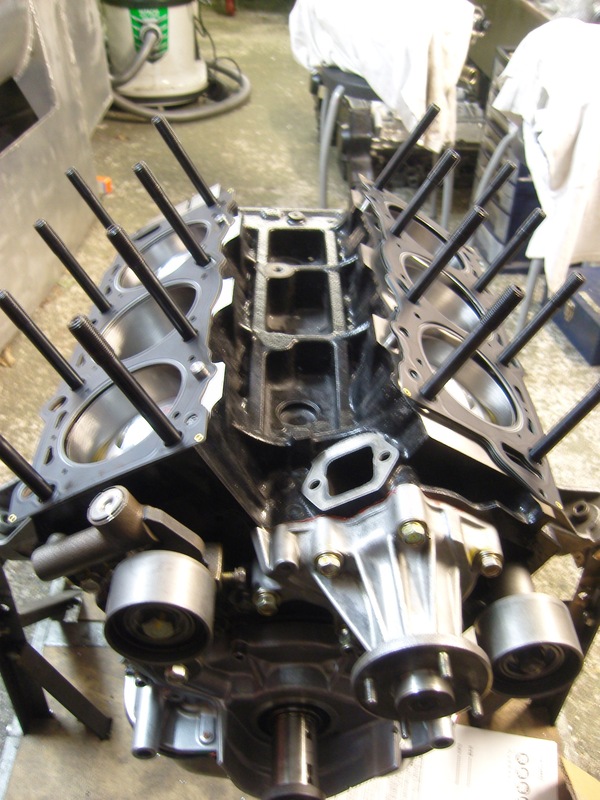 These lifters delete the heavier factory hydraulic lifters,require less oil, and allow more aggressive camshaft profiles. 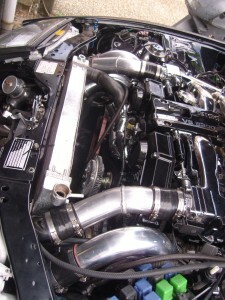 Along 2 HKS GTRS turbo’s were fitted, good for 400hp a piece. 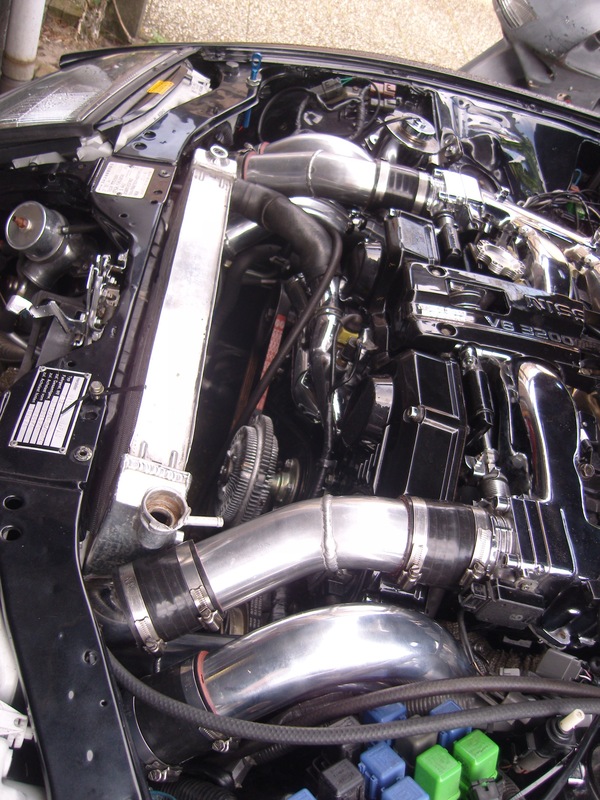 A larger radiator, enlarged stainless exhaust, front mounted enlarged intercooler, uprated fuel system with an AEM standalone engine management and several smaller parts completed the build. 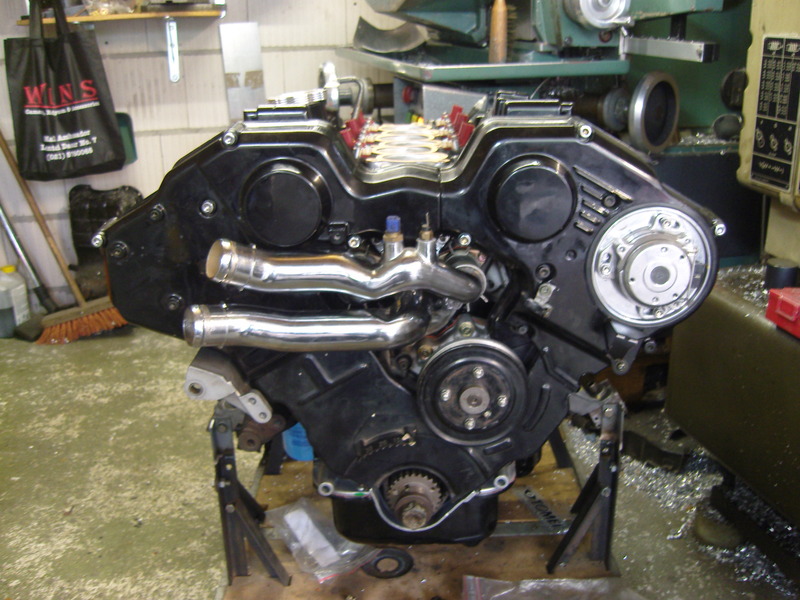 The build up of the engine was straightforward, problems only occured with the aftermarket ‘bolt-on’ parts. The oil pan was transfered from the previous engine, but since this engine had so many aluminium shavings in it the pan had to be cleaned thoroughly. This pan contains many baffles making it difficult to do. First, I pressure wash the pan with an aggressive cleaner. 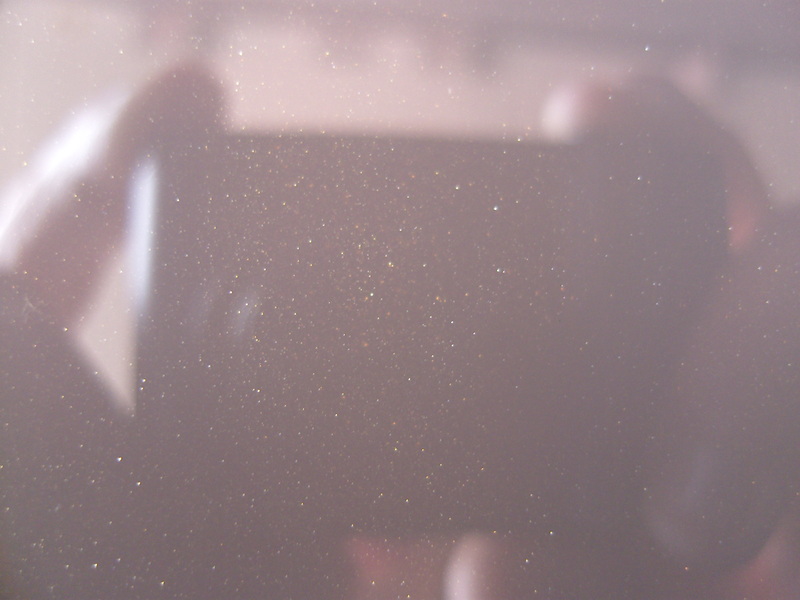 Then I fill the pan with oil, and have this oil sucked through a fuel filter by an electric pump. Fuel filters hold smaller particles, but also offer a stronger flow resistance so it takes some time to flush. I pumped 10 liters of oil through the oil pan, and replaced the oil again after engine cranking for 2 minutes without the engine having even run. The cams from the previous engine could be saved after a polish job, but the valve lifters were severaly damaged and replaced. The variable valve timing is deleted through these camshafts, and this allows fitting of Tomei adjustable camshaft sprockets. 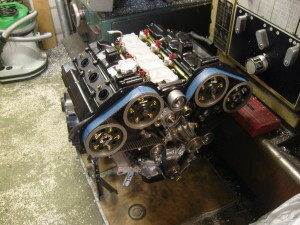 Adjusting the cam timing allows the tuner to move the powerband to optimise the engine’s performance, but on a V engine it’s also used to synchronize the left and right cylinder bank. In order to have identical performance from both cylinder banks, the opening and closing timing of the opposing camshafts needs to be in perfect sync. 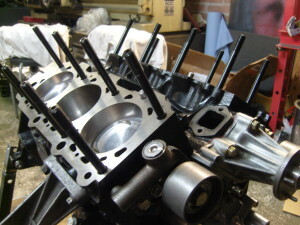 As I was setting the cam timing up, I had to take into account that I shouldn’t mess around too much with the cam timing set by the previous engine tuner. 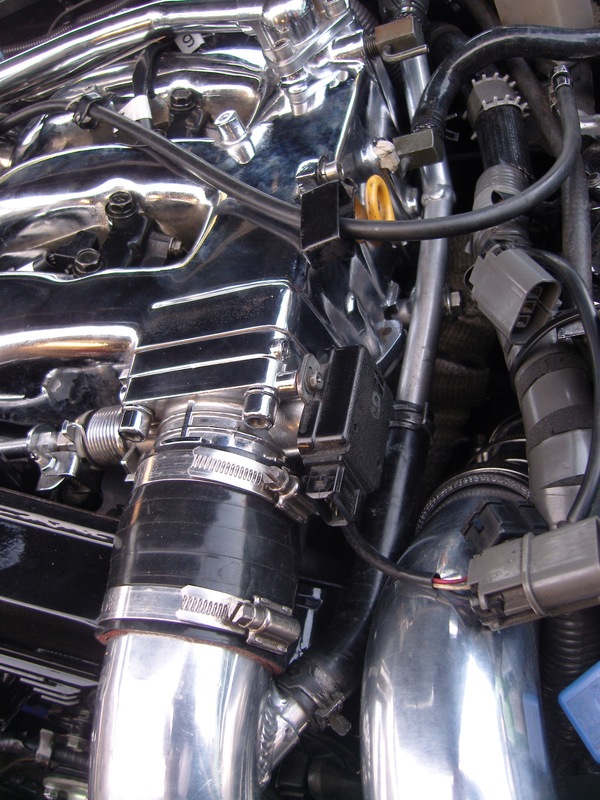 As the engine management works with a MAP sensor, messing around with the cam timing could alter manifold pressure and the engine might not run well. Although the engine has to see a tuner to complete the mapping anyway, I wanted to deliver the car without mechanical issues and thus checked in (reasonable) running condition. 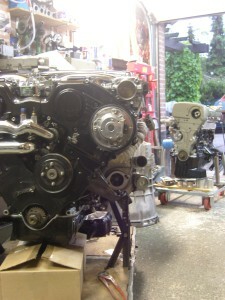 I fitted all timing belt parts in position and placed a degree wheel on the snout of the crank. 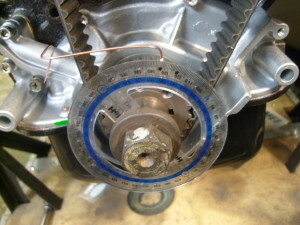 The camshaft sprockets were set at identical angles for the left and right bank. I placed a clock micrometer to measure valve lift on top of one of the lifters. I measure the crankshaft angle at 8,00mm lift on opening, and then again at 8,00mm lift on the closing pass. 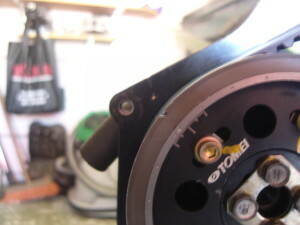 The average crank angle between the 2 is the peak lift point for that cylinder. I then perform the same test to the other cylinder bank at the cylinder 360° opposed and see if the timing corresponds. 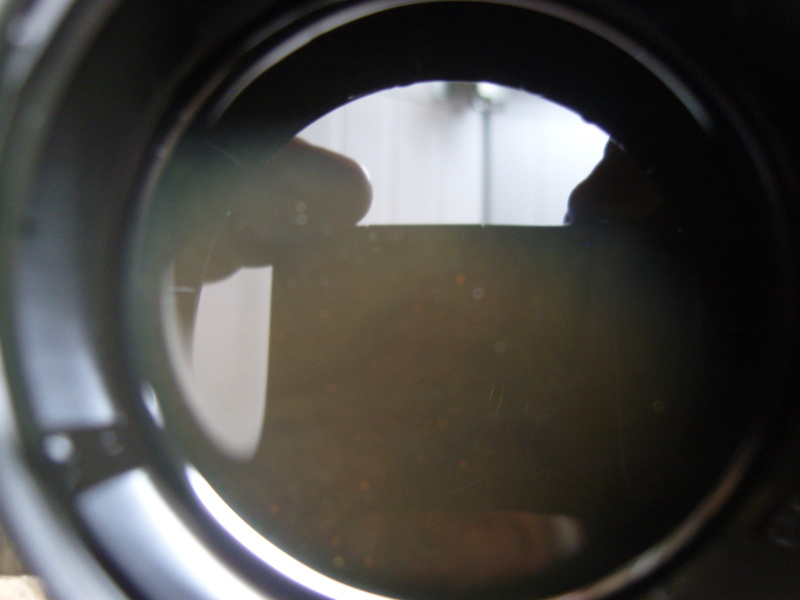 I perform the test several times on different cylinders to rule out inconsistencies. What I found was quite discerning; the exhaust timing was just 1° off, but the intake was 5° off measured on the crank. 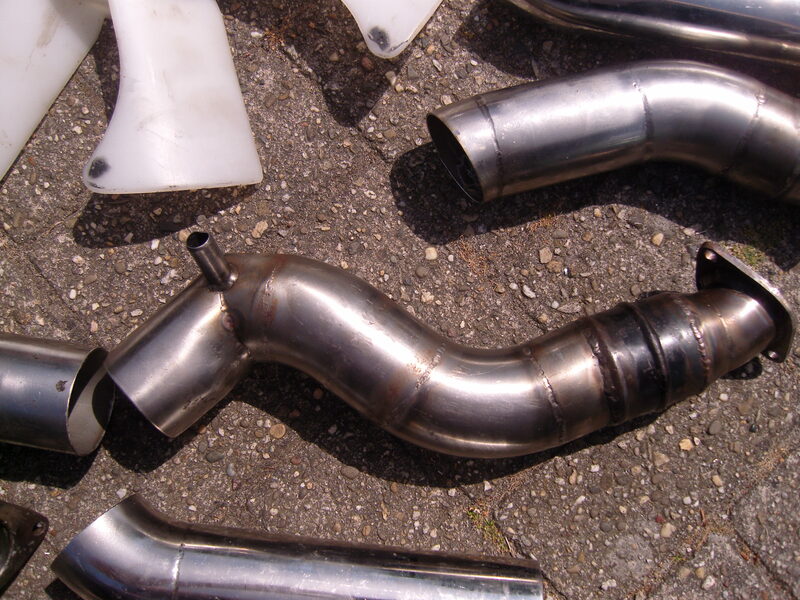 Since the heads have been skimmed 2 times, a discrepancy was to be expected but on exhaust and intake the same. What could cause this? 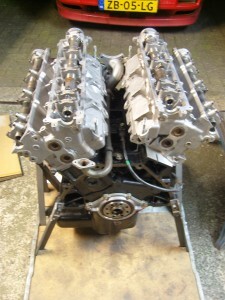 I suggest that when these camshafts were custom ground by JUN they didn’t align them very well. 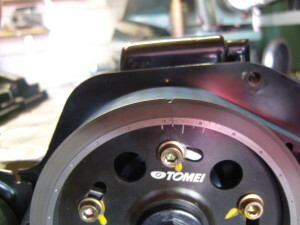 The previous tuner never adjusted for the difference, but it soon turned out this wasn’t the only thing he overlooked. These pictures were taken after adjusting for the timing difference. Note how the left and right intake sides are 2,5° off in timing indicated on the sprocket (this value reads double on the crank). 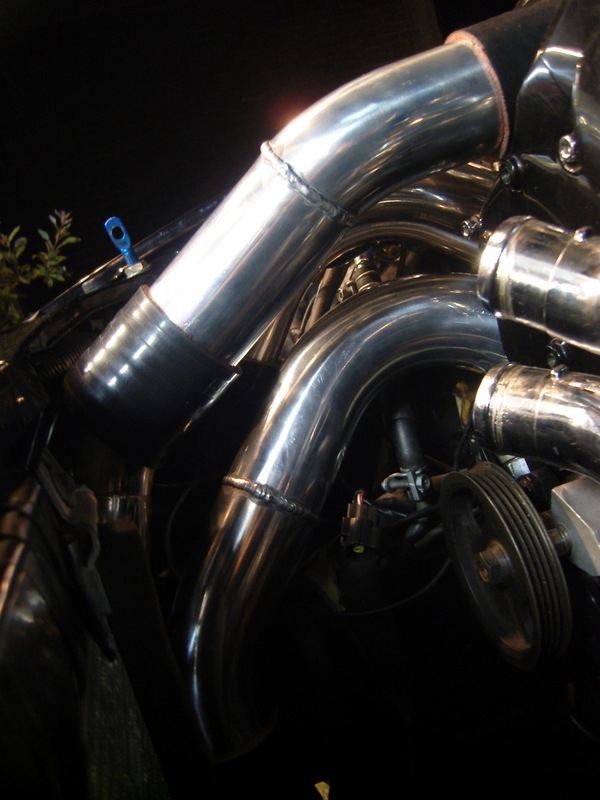 I noticed that the inlet cams were set at a relatively retarded setting, and the exhaust side advanced, probably for smoother idle due to less overlap. 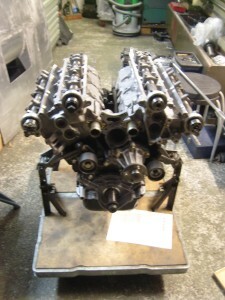 But for more overall power it’s better to advance the inlet camshafts. So the right side cam was advanced 2,5° to sync them. 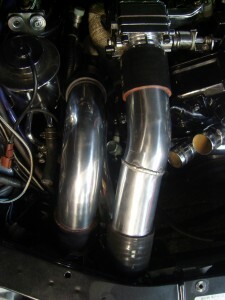 The exhaust was also sightly adjusted for the 0,5° difference, in this case I retarded the left side cam. 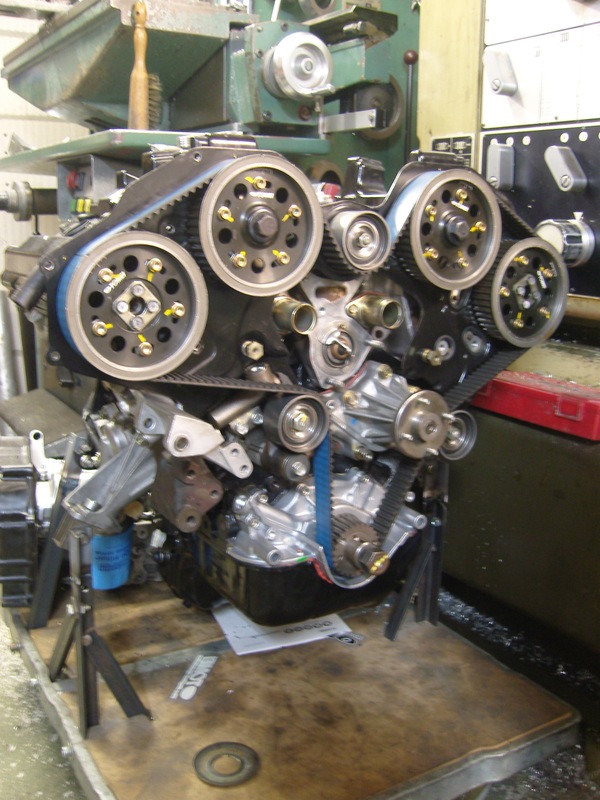 I passed this information on to the tuner who was going to map the AEM standalone engine management, in case he wanted to advance the cams even more, and get confused from the discrepancy the sprockets indicate. 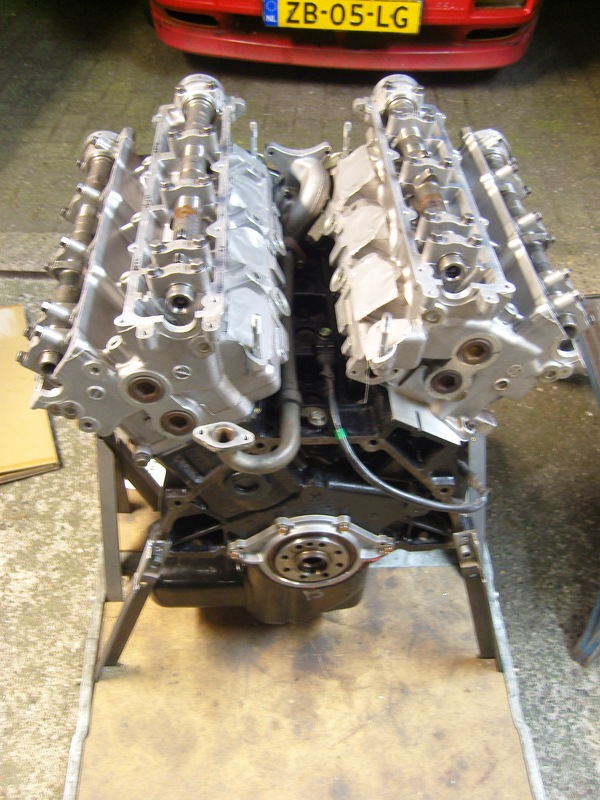 More progress on the build-up, with the complete upper manifold and 740cc injectors. 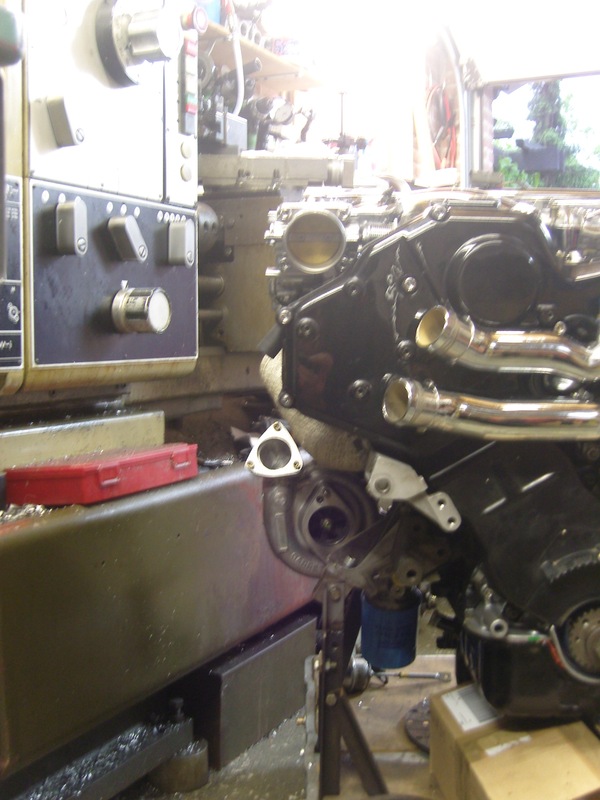 I don’t work on the engine right next to the lathe and milling machine for obvious reasons, but it’s good photo location due the lighting. 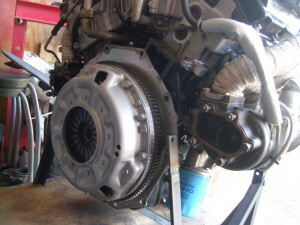 A new lightweight flywheel with single plate high performance clutch was fitted. The clutch won’t hold what the engine can produce ultimately, but the owner wants to start with a bit less power and upgrade the clutch later. The turbo’s were also fitted at this stage. This is where the first serious problems arose. 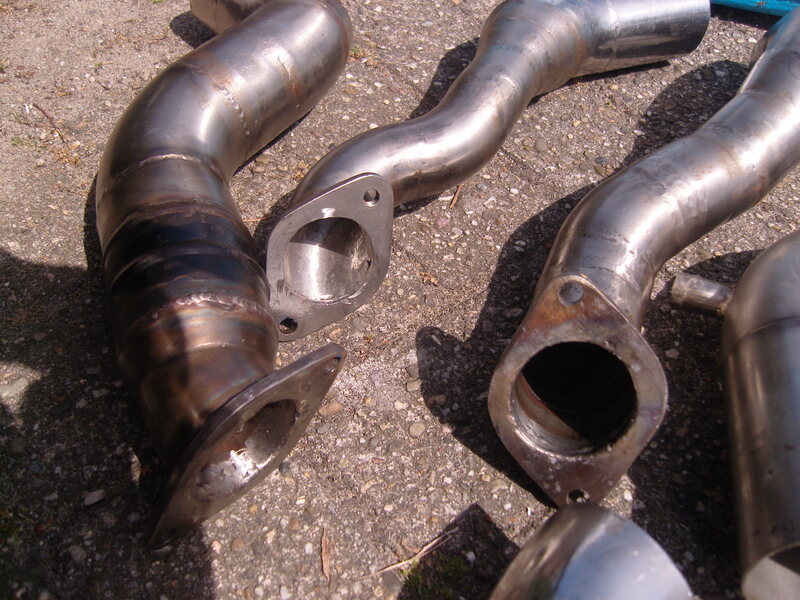 The owner purchased tubular stainless exhaust manifolds that thanks to their design have a tendency to warp excessively. Despite having seen only several running hours on the previous engine, the flange faces were warped up to 2mm, and both required skimming. This was not an easy job, since the manufacturer of the manifolds had choosen stainless steel for the 1-piece flanges. Stainless steel should never be used for flanges due to it’s unfavourable heat expansion rate, let alone as a single flange. 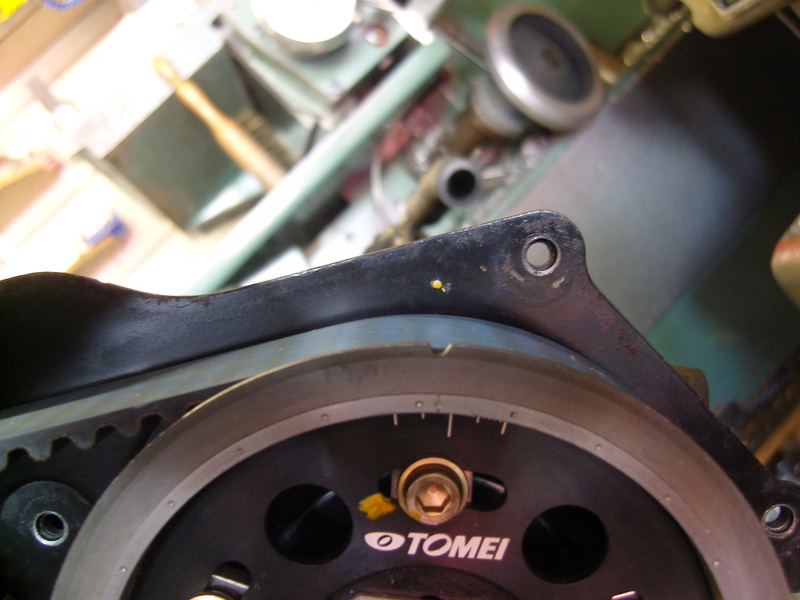 I therefore cut the sections in between the flanges for more expansion freedom before skimming them. 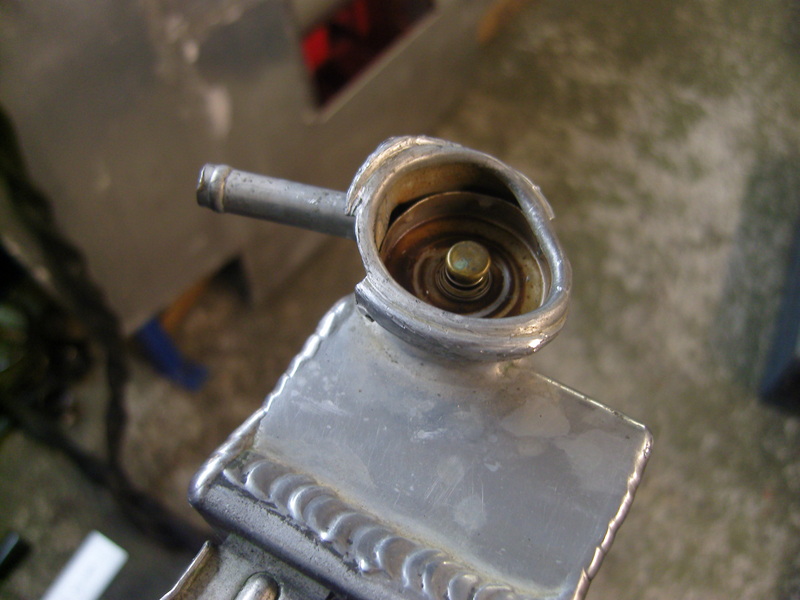 An expanding manifold can easily break a stud in the head which is an ‘engine out’ job on a VG30DETT, so this should be prevented. 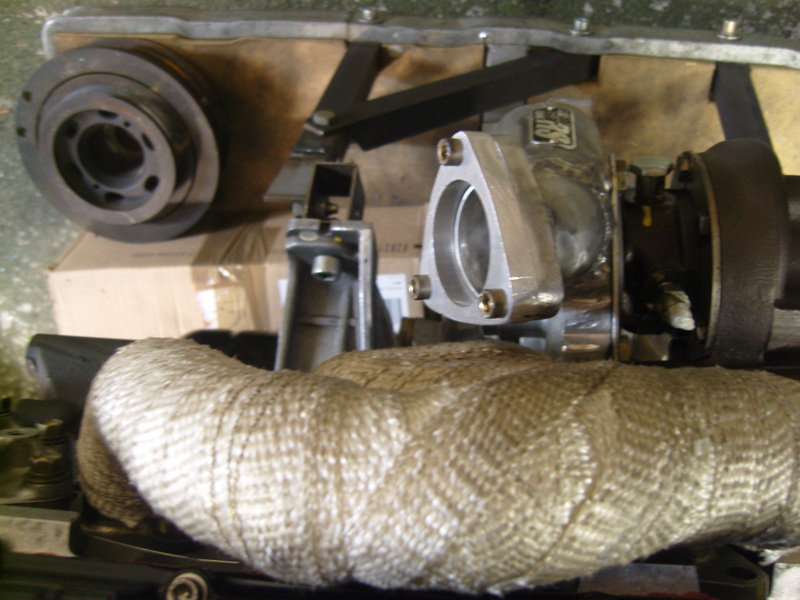 But the warped manifolds also changed the location of the turbo’s, the driver side turbine housing jammed up against the block when I tried to mount it. I had to mill a section out of the block to make it fit. 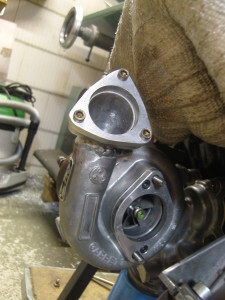 It is most likely the turbine was already jammed up against the previous block as well, the flange skimming alone could have never caused such a large deflection. 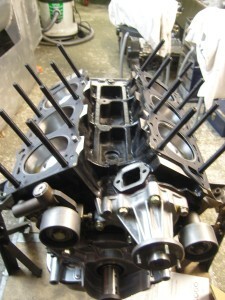 Even if the previous engine had not died from oil starvation, that manifold would have cracked in no-time from the pressure against the block. 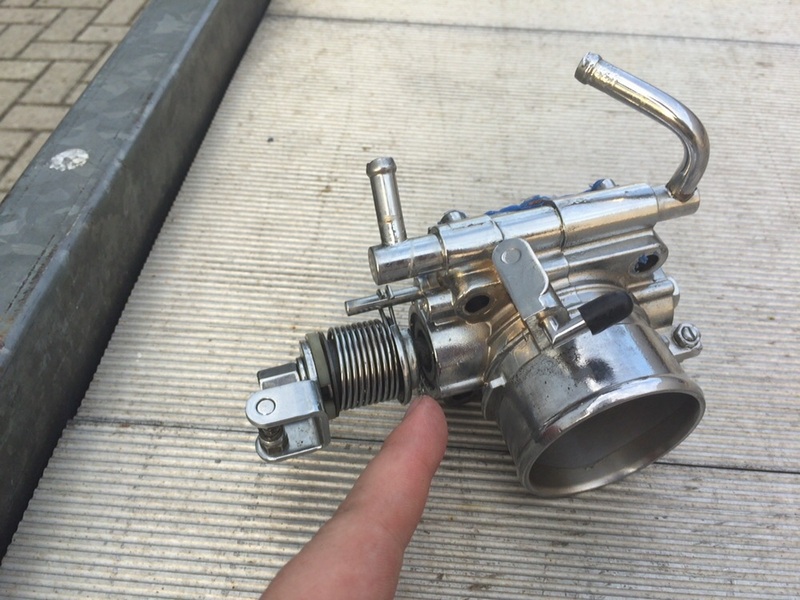 I also noticed that the previous tuner who assembled the engine used the wrong copper rings for the turbo oil feed banjo bolts. 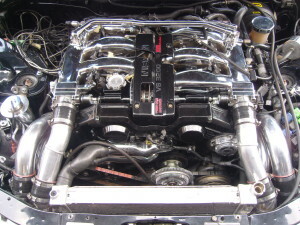 He used the 11mm copper rings Nissan supplied with the engine rebuild kit, but since these aftermarket turbo’s use smaller 3/8″ banjo bolts the copper rings were too large. Since they were easy to access, I cranked the engine using the Nissan 11mm rings to see how fast they would leak. 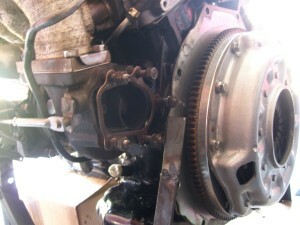 Even while cranking to just 300rpm, at minimal oil pressure, the rings leaked…. I sourced the right 3/8″ rings and it was good to go. 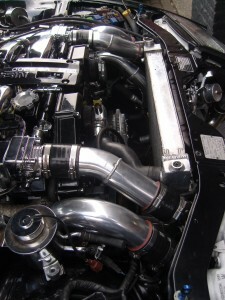 When this engine was first build-up over 10 years ago, the large HKS turbo’s did not fit the existing intercooler and suction piping. 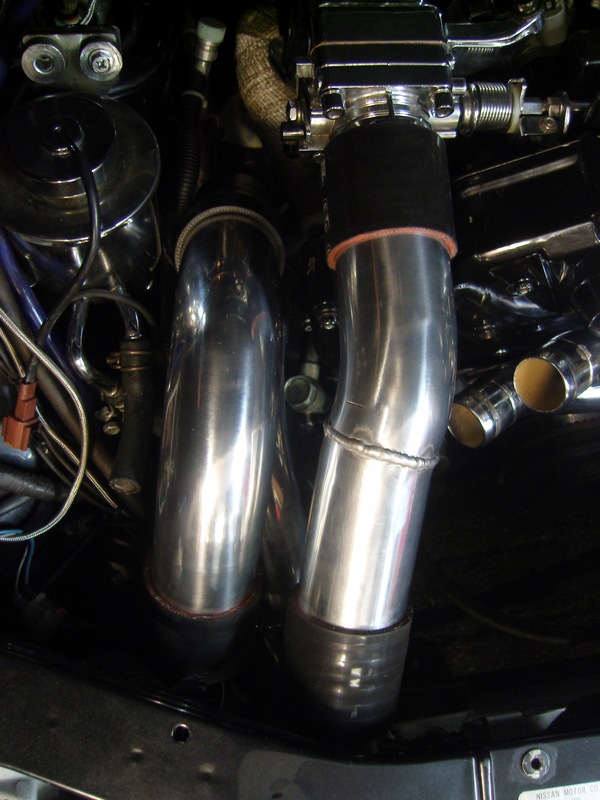 So the tuner who worked on the car at that time fabricated stainless steel piping to make everything fit. The work was not performed well. None of the welds were made with filler rod, being too thin and with severe burn through marks on the inside of the pipes. 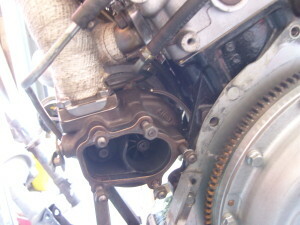 The inlet for the compressors were smaller than the inducer from the compressor wheel, forming a pointless restriction. The compressor outlets stood at a sharp angle and have a smaller diameter than even the factory piping. None of the pipes had beaded edges, and since many of the hose connections were on a bend section the whole thing was a disaster waiting to happen. I also found that the pipes sitting around the radiator, intercooler and airconditioning system were jammed up against each other, placing everything under tension. In fact, I was unable to fit the pipes back in place without excessive force. In order to bring everything back to 100% reliable condition, I started by cutting of the compressor outlet flanges from the HKS turbo’s, and relocate them pointing forward. The driver side turbo was easy, a simple 90° bend with a 50mm hose connection faced it forward. But the passenger side was tricky, since there’s several lines from the power steering and airconditioning blocking the way. 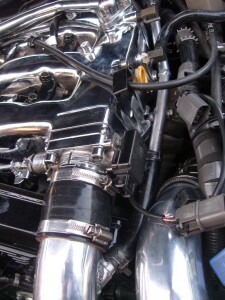 A hose connection is not possible due the proximity of the exhaust manifold. 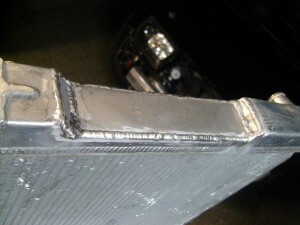 It would be impossible to weld anything to the compressor housing once the engine was mounted up in the car, but the only way to check for clearance is to have the engine in the car… So I ended up welding a 3 bolt flange to the compressor, facing forward and 20° up. With the engine in the car, I fabricated a pipe with a hose fitting that could be welded to the correct angle. With the engine and 5 speed transmission mated the engine was placed back in the car, I also fitted all the required manual transmission conversion parts. Note how little space there is around the in and outlet of the passenger side compressor. Both turbo compressors inlet (suction) pipes were newly made, the passenger side had just enough clearance between the motor mount underneath it. 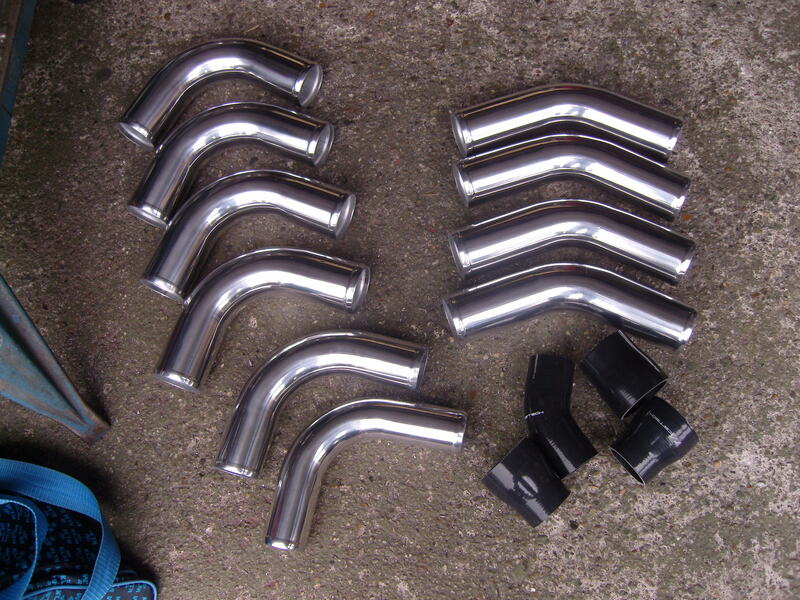 The new aluminium piping is 63mm. 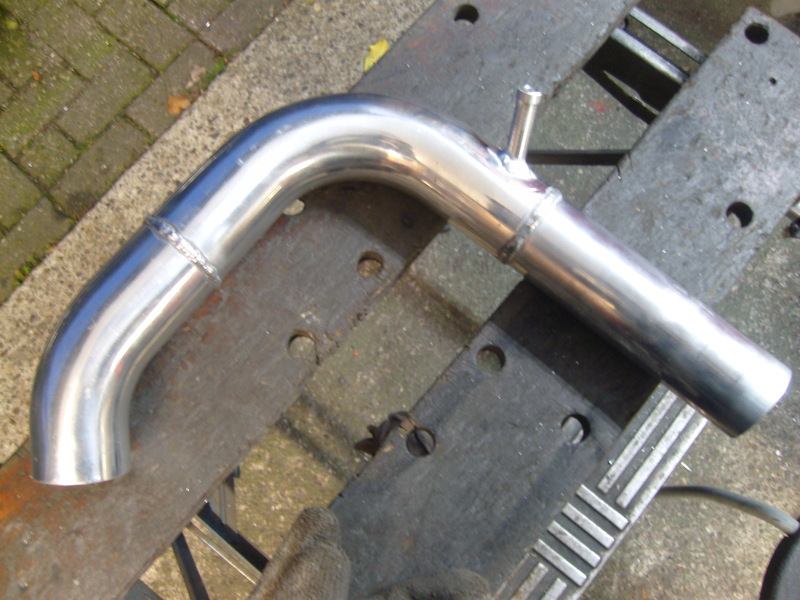 The previous ‘builder’ had also used 63mm piping. 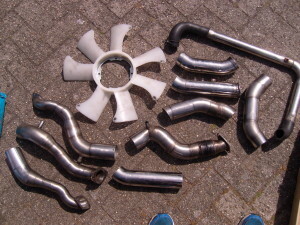 But the intercooler and throttle body hose joints are 60mm, for which he used straight 63mm hose. As a result, they were only held by clamp pressure from the hose clamps. 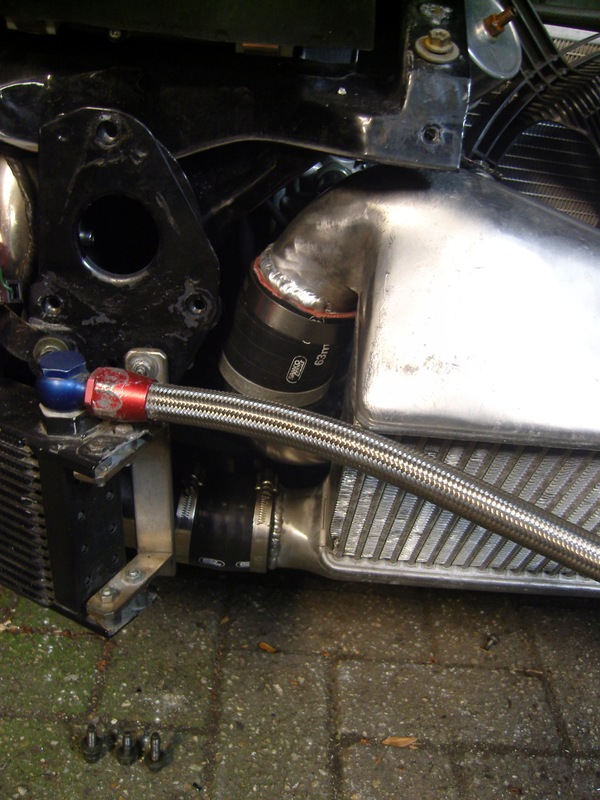 Due the tight, and short fit of the intercooler hoses, I could not use 60-63mm conversion hoses, so I welded 63mm pipes to the intercooler in-and outlets. 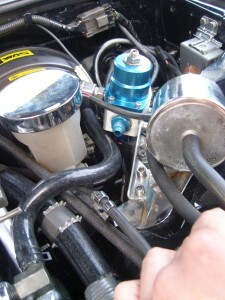 The non-weldable throttle bodies did receive new 60-63mm conversion hoses. The radiator was cut open at the endtanks to narrow them, but as I did, I noticed that the radiator was never supported at the bottom. 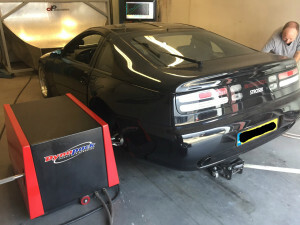 This car started life as a non-turbo type and has different mounting points that don’t align with the new twinturbo radiator. 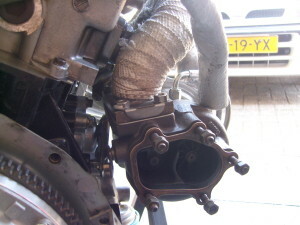 It was held in place by a combination of the upper brackets, tension from the piping and it’s own upper and lower hoses. I made 2 new mounting sleeves and welded them to the bottom for proper support through the factory mounting spots and rubbers. 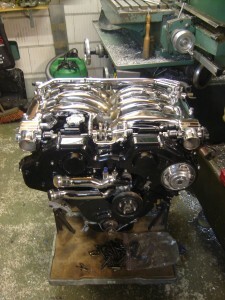 Engine and manual transmission ready for installation. 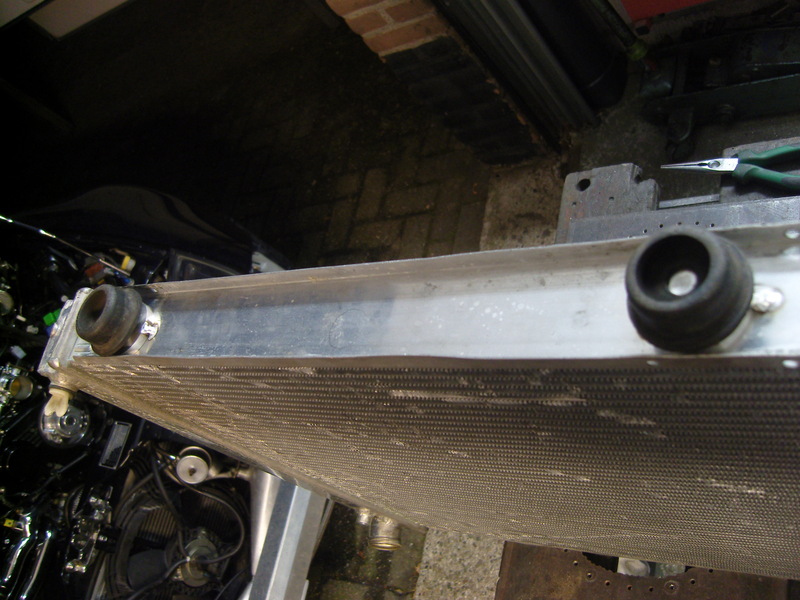 I welded a new coolant pressure cap fitting to the radiator (note the dent in the old one from someone dropping it) and fitted the coolant fan and shroud. The fuel pressure regulator (FPR) was dangling on a single body screw to the firewall, and the fuel line fittings were used with the wrong hoses and clamps. The whole thing was another disaster waiting to happen. I made a sturdy bracket for the fuel pressure regulator and reinstalled the reliable factory hoses and lines where I could. The aftermarket FPR uses -6AN fittings, but I had connectors to convert them properly to 8mm Nissan hose. 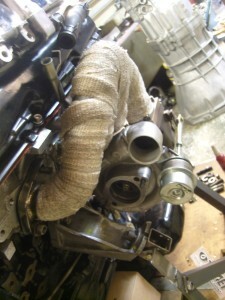 The idle air take off on these engine is from the driver side turbo pipe going to the intercooler. 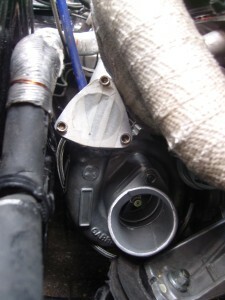 However, it allows hot air to bypass the intercooler once the boost comes on, so when I design a custom intake system for these engines I always convert the idle air feed to the ‘cold’ pipe in front of the throttle body. 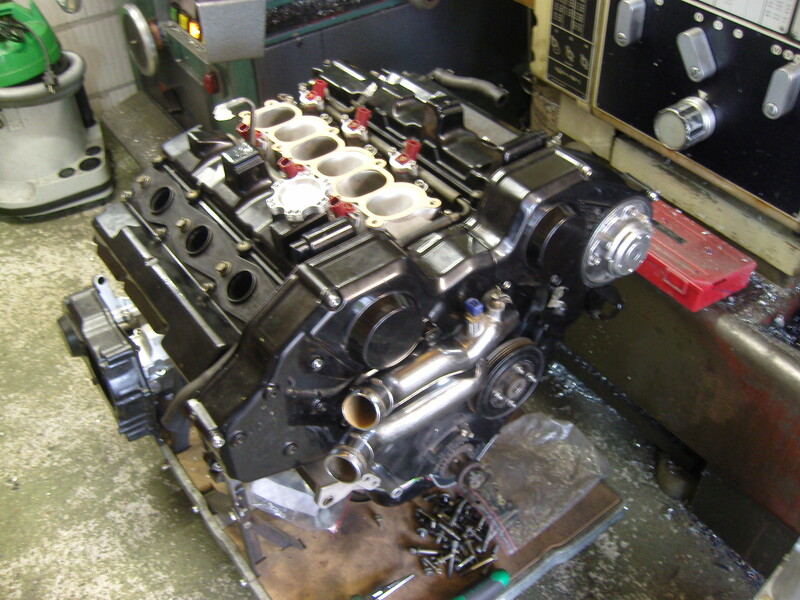 After all the engine ancillaries were fitted and fluids filled up, the engine fired right up. 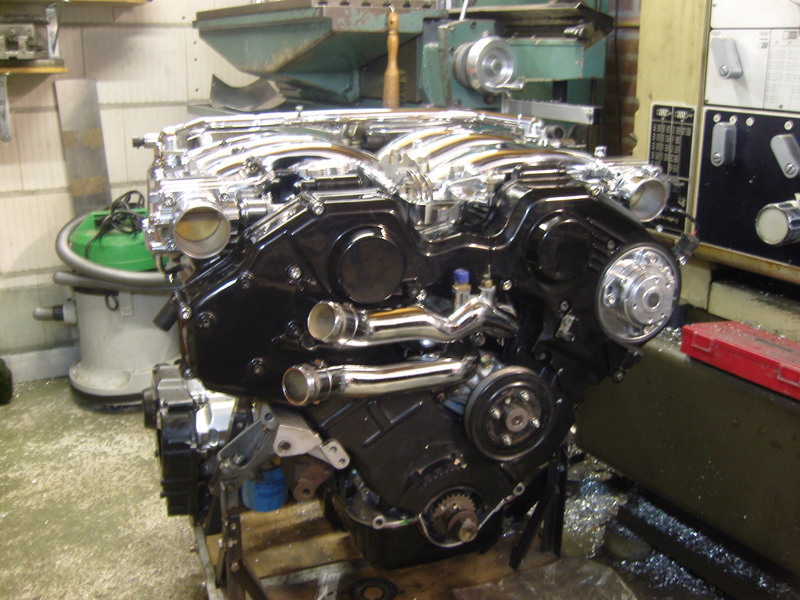 I quickly took it for a ride to load the engine up a bit, but the engine hunted, had poor throttle response and felt very raw so I only drove it twice for 15 minutes. I replaced the oil and left it to the customer to take it to the engine management tuner after ensuring it was mechanically sound. As the tuner it was first brought to turned out to be a fraud, the car was brought to the tuner who originally installed the AEM standalone (he had nothing to do with any of the poor work performed before). The engine still had some minor issues, mostly trouble synchronizing the air/fuel ratios between the left and rear bank. The problem was traced down to a leak in the exhaust just in front of the wideband sensor, likely caused by the manifolds warping again as much higher exhaust temperatures were reached during tuning than the short test drives I did. One throttle body also had leaking seals. The throttle bodies had been chromed but carelessly asembled by the chromer. 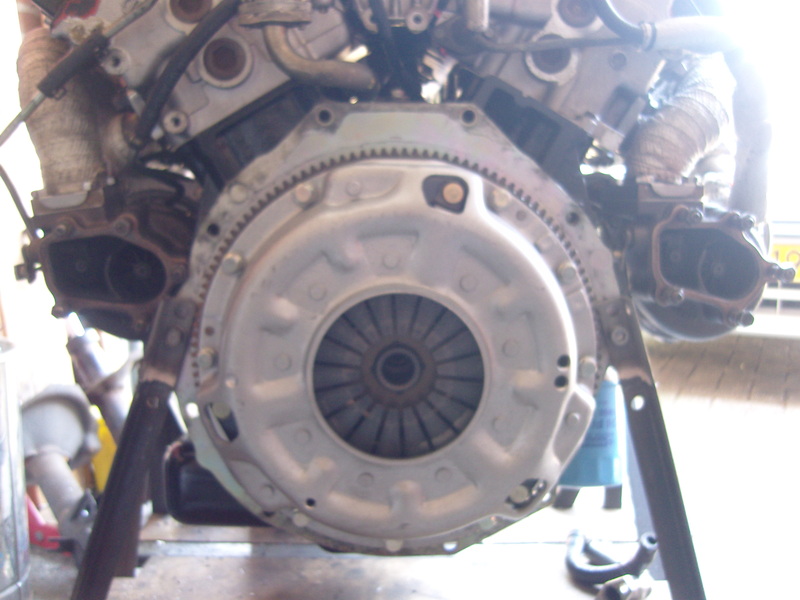 I replaced the leakin seals and the engine was ready for mapping. A few weeks later, the results came in. The engine produced a corrected 540hp @ flywheel, high in the 400’s at the rear wheels. 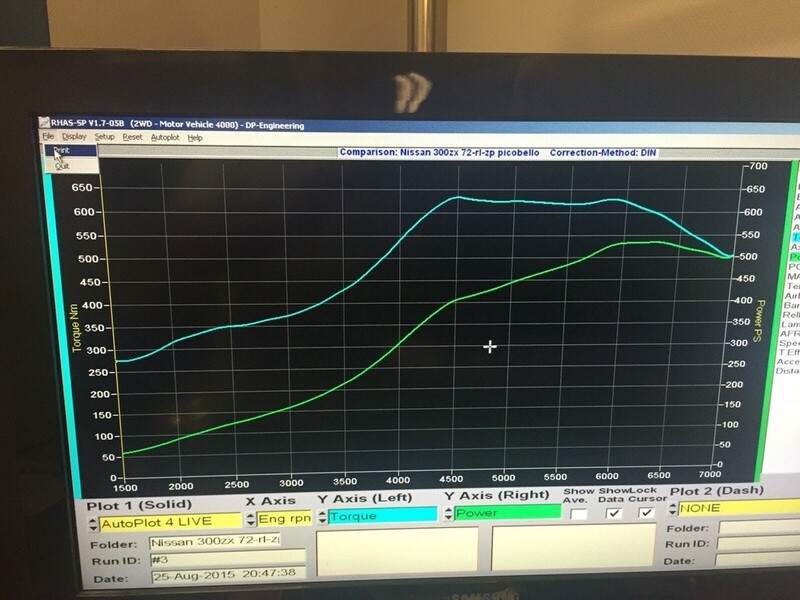 This was on 0.9 bar boost pressure, running the factory primary catalyst, and restrictive mufflers on 95 RON without electric boost control. Plans for the future are an upgrade on the clutch (limit now about 600hp), the fuel system (700hp max currently) and a larger more open exhaust with upto 1.8 bar boost pressure. The engine should be capable of close or even over 800hp depending on the knock limit.